Written by Tom Hanks and Nia Vardalos (My Big Fat Greek Wedding). Produced by Tom Hanks and Gary Goetzman (he and Hanks founded the production company Playtone). Starring Tom Hanks and Julia Roberts. Directed by Tom Hanks. Motor scooter driven by Tom Hanks. French toast by Tom Hanks. Thirty-five percent. Yep, just thirty-five percent on Rotten Tomatoes. That's not promising. No, that's not good. As the web site summarized this romantic comedy: Despite the relaxed, easy chemistry of stars Tom Hanks and Julia Roberts, Larry Crowne is surprisingly bland and conventional. Despite that little bit of negativity, I have to admit I liked it but, but, but I like Tom Hanks and who doesn't like Julia Roberts? I see what the critics or Rotten Tomatoes are saying. If I stand back and look at it, in all honesty yes, it is bland and conventional. Nia Vardalos came out of nowhere with a huge hit, My Big Fat Greek Wedding, but somehow, what's come after has not lived up to that surprising start. Is this a case of where it may be better to start slow and work your way up? I see her name attached to the writing and I'm thinking that her subsequent efforts make me believe Wedding was a fluke; she may be a one hit wonder. I can't comment on Mr. Hanks' supposed writing or creative skills. In looking at what other critics have written, I am being very generous with Mr. Hanks. "Larry Crowne" has Tom Hanks and Julia Roberts and a good premise and a colorful supporting cast, but what it doesn't have is a reason for existing. The screenplay carries blandness to a point beyond tedium. I'd be curious to have an experienced screenwriter get a hold of the screenplay (which Hanks co-wrote with Nia Vardalos) and examine it page by page, asking questions like, "Why is this character doing this?" and "Why is this character even in the movie?" and "What purpose does this scene serve?" and "What is the story arc?" and "Is it even remotely plausible that someone as outgoing and personable as Larry would be such an inarticulate public speaker when the speech class begins?" The margins would soon be filled with question marks scribbled in red ink, and the experienced screenwriter would have a migraine. Somewhere in a dark corner of hell, a satanic film class is waiting to study Larry Crowne. Okay, you get the idea. From here, the humour in this or any other review is going to be finding the funniest cut-up, the wittiest put-down, or the most direct kill-me-now comment with or without profanities. This would be a not bad film to see on a Saturday night at home with a big bowl of popcorn. It's not bad. It's not great. It's not quite good, but it's not bad. I like Tom Hanks so in that regard, it was hard to go completely wrong. However rather than having an inspired cinematic work of art, this is a technically executed piece of craftsmanship. I would not spend my money going to the theatre to see this. There are no special effects which could benefit from a large screen or IMAX for that matter. There is no terrific sound track demanding a ten thousand watt system. Wait for that Saturday night when you have nothing better to do. And having a beer or two with your popcorn wouldn't hurt. Despite the relaxed, easy chemistry of stars Tom Hanks and Julia Roberts, Larry Crowne is surprisingly bland and conventional. Larry Crowne is a 2011 American comedy-drama film starring Tom Hanks and Julia Roberts. The film is directed by Hanks and written by Hanks and Nia Vardalos. 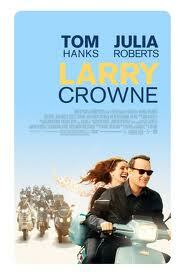 Larry Crowne was released on July 1, 2011 in the United States and Canada.